This is Iri. She's been our friend since we arrived in PNG. Her family and our family have been closely intertwined for 12 years. She became a grandmother not quite two years ago, but she still plays soccer. Look at her smile! 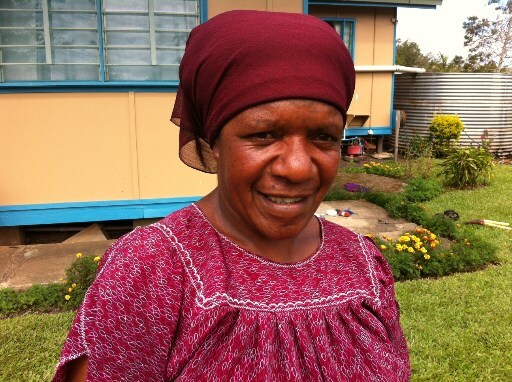 Iri and her family are Papua New Guineans with a strong faith in 'Papa God'. When they suffer hardships, we share in those with them, and to hear them declare their prayer lives, and how God will care for them, encourages us. So why did I title this blog entry 'discouraging smile?'. At times in our lives we all suffer discouragement. Don't read anything into that, we're not suffering any 'more than usual' discouragement right now, so maybe it's a good time to post this? -When in your head you're feeling discouraged, and down. The best cure, is to do something for someone else. This gives you a chance to step outside of your own head and apply God's Word by showing love and caring for someone else. That's my cure, it's as simple as that. I've found that 100% of the time, doing an action to serve someone else, to help them, always brings me out of a funk. Why? I theorize its because I stop thinking about my own woes for a time. But maybe it's more, maybe it's because we're behaving as God intended? Maybe we get blessed more than we bless? This morning I stopped, and I thought 'did coming here accomplish anything? And if so, was it enough?'. Yeah I know, a totally Western thought. That question kept resonating in my head as we celebrated Bible Sunday and saw all the work our community has done in the past year. 'Was it enough?' Like the end of Schindler's list. As we're coming up on our 12th anniversary that question resonates in my head. But then, I think about Iri. About her family. About where they'd be if we weren't here. About their kids and the impact we've had on their lives. Would that one family be enough? Would 1 person be enough? Would seeing God sustain, transform, support and otherwise simply... you know without doubt that God put you in a place in a life, to be His outreaching hand of love to them... even for an instant, be worth everything? Yeah it would. And so I think of Iri's smile when I'm discouraged, and the encouragement it brings me. It doesn't remove the things about life here that discourage me, but it does help me see things with a little bit of how God must see this world. Shining bits among the dark. New shiny bits arriving daily. Shiny bits shining brightly in the dark, is sort of what it's all about. So today, I plan to be a shiny bit. Filling my heart with the love of Christ so that others may know His love. p.s. Here's the reality of ministry work. You may never know the impact you had on someone's life. You could drive yourself nutty trying to answer 'what is the best thing I've done?' God works in ways we don't see or understand. We have no real way of knowing the impact we've had on people's lives. I think that's why God tells us not to tire of doing good. Because if you expect results, you may not get to see them. But those rare times when you do see something, they are precious, and they keep you going.